I'm sure many folks saw the 60 Minutes special about the inhumane treatment of cattle and have read about concerns about preventive and other antibiotics given to cows. Pretty scary. La Cense is a ranch in Montana - one of the oldest in the state. They have been selling natural grass fed beef since 2002. The cows rotate on grassy pastures eating only natural vegetation. Some companies say "grass fed beef" but fatten up the animals before slaughter with grain. La Cense is 100% grass fed. Growing up I always loved fresh beef when my Poppaw would butcher a cow. If you've never had meat from free range cows, then you're missing out. The meat is healthier for many reasons. In fact, grass fed beef ranks close to chicken breasts as far as being low in fat. They aren't bulked up like grocery cows. The flavor is wonderful too. 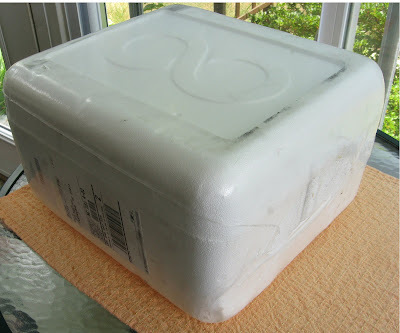 My box of La Cense meat came in today. 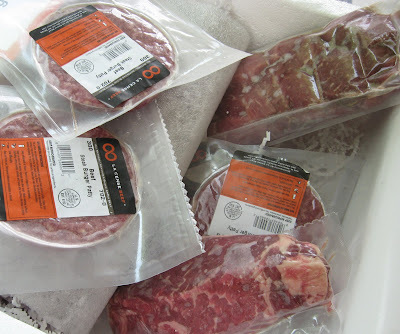 The package was pefect, and the meat looks wonderful. My son works late tonight and the meat is frozen good and solid, so I think we'll plan on a cook out tomorrow night. Can't wait!